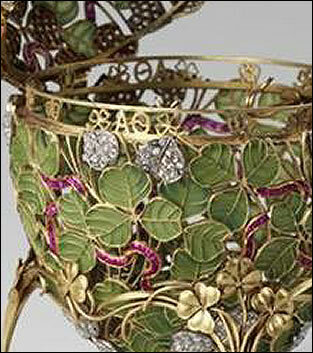 The 1902 The Clover Egg is made of green gold, platinum, rose-cut diamonds and rubies. The now missing surprise was probably made of gold, diamonds and watercolor on ivory. This simple pattern of stems and leaves of clover makes the shape of an egg. It seems to be woven of very tiny golden threads which span a very expressive picture. 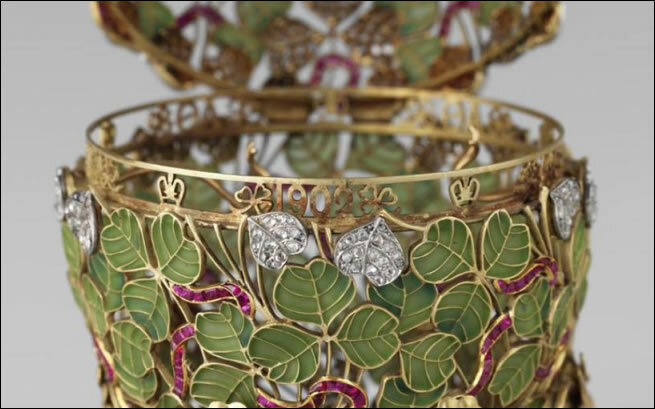 The gaps between the metal outline of leaves are covered with transparent bright green enamel. A very thin golden ribbon paved with rubies curls here or there through the rich foliage. The edges where the top and bottom halves of the Egg meet, are almost hidden by the cleverly placed clover leaves. The Egg stands in a three-legged gold bracket of clover leaves and curving stems, with inward-turning foliate feet. The transparent enamel was a new method in art. It was very difficult to create. Usually the artist used a very steady alloy of enamel because having no support the enamel could crack while being fired or while cooling. You see how the work with enamel in this masterpiece is perfect. There are no bubbles or cracks in the enamel. All above images of the Egg, courtesy Paul Kulikovsky Romanov News. 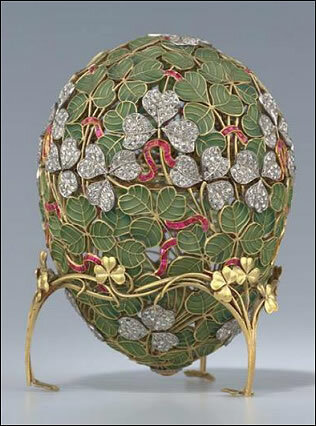 This Egg is considered one of the finest examples of the jeweler's art anywhere in the world. 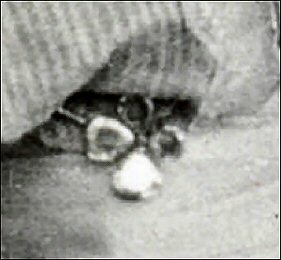 The "surprise" of the Egg had been lost but according to the archives four leaves with 23 diamonds and 4 portrait miniatures of the Emperor's daughters were fixed inside the Egg. Little clips inside the Egg probably held the surprise in place, much like the 1914 Mosaic Egg. 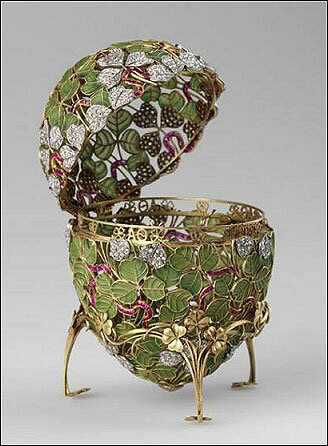 The 1902 Clover Leaf Egg never left Russia and is since 1933 housing in the the State Museums of the Moscow Kremlin. Because of its fragile nature, the Clover Leaf Egg does not travel. Update 2018 - Could the surprise of this Egg have been identified? Could the surprise of this Egg have been identified in an old photograph? You be the judge!